How important is it for us Mums to maintain a self of our identity after having kids do you think? How much should we be doing purely for ourselves every day or every week? Lots, a Little, or somewhere in between? I had a ‘discussion’ with a mate about it (thank goodness she is a good mate and doesn’t mind it when things get a bit heated). We very much disagreed on the answer. She was all for Mums really keeping a sense of them self as a separate identity and doing things for themselves. She really disliked the idea that I encourage Mums to look after themselves because it’s good for the children and the family. My argument that once they got used to it, they would then do it for themselves wasn’t good enough she reckoned, because they weren’t doing it explicitly. I said that that in reality it depends on the age of the kids, because as our hormones settle and the kids get older, we naturally start to separate more and ‘remember’ who we were. I reckon that you can tell the Mums at the school gate who no longer have babies/toddlers/pre-schoolers, because they noticeably look after themselves more. Plus, I worry that a Mum desperate to keep hold of ‘who she was’ can develop problems with connecting with her children, because it’s frankly not possible. We aren’t the same after children. We aren’t totally different either. You know how I love to encourage Mums to ‘sparkle‘! But I’m realistic. I just think it’s important that they don’t forget to keep ‘sparkling’ and do a little bit, but the amount of sparkling kind of depends on the age of our kids, our finances and our circumstances i.e. how much support we have to give us time to look after ourselves. There’s a huge time factor to it; little ones take more time, big ones take as much input, but less time I reckon? I have created a totally unscientific chart to highlight the difference (notice the quality of drawing – I haven’t skimped a thing on it, apart from money and skill!). So when we’ve just had a baby its a massive achievement to have a shower every day in the first few months. Then it’s about going out for a walk and maybe meeting up with other Mums. Some Mums will be back at work pretty quick, which can be a good bit of ‘time out’ and a chance to start to make ourselves look more presentable, but it’s a lot to fit in ‘me time’ too. I’m not keen on worrying about weight loss for at least 9 months, or more likely 1-2yrs, but eventually we tend to have a look at what our bodies are doing. Mind you, I’m finding having two kids much harder, so that is a factor too. Reality is that ‘we can’t have it all’, in my opinion. How much are you doing EACH WEEK to look after yourself? Nothing? 30 mins? 1hr? 15 minutes a day? Are you naturally a ‘yummy mummy‘ so you have it in your mindset to take care of yourself? Are you making the most of the support you have for baby sitting or getting the chores done? What do you reckon is the VERY LEAST that you could be doing for yourself every week? There’s a fab new linky on the Mums and Me site, which I bet you’ll love to read or blog about each week with ideas for having a bit of ‘Me time’. Go and check it out, apart from the fact that they have great taste (they quote me! ), I think it’s a lovely simple idea. Tips for saving Time, Tips To Get More Energy, Tips to get more Sparkle, Tips to more Contentment, Working Mums Can Mums Have It all, How important is it to take care of yourself as a Mum?, Me time for Mums, Should mums sacrifice everything for their family?, Should mums try to keep hold of what they were before? Is Having Two Kids Harder Than One? @anya thank you lovely – sorry my comment kept getting eaten up on your blog, I had the same problem elsewhere as well. I Think the answer is that they should put themselves first more than they do currently. @kelly yep that is a good simple answer! @rachael ooh well done for going back to college, I think that’s a great idea as you ‘grow a new you’! @muddlingalong you are definitely the mistress of packing in so much to your life for you, work you and the kids! I am so going to take this theory on board, having my fourth baby in 5 weeks and this seems feasible (she says optimistically) I think we all need some ME time! @danielle have you read my post about having 2 children being harder than 1 LOL? Yes you definitely deserve some ‘me’ time, but it looks to me like you also love family time, and that’s brilliant! Having just the one child at the moment who sleeps beautifully I have plenty of time in the evenings for a nice bath and tea or to go out somewhere and even during nap time I sit at twitter rather than doing housework. I can’t face leaving the house without eye liner on either so I am guessing I have a good balance? For me it is what keeps me sane and it was never optional although in those first few weeks having 15 minutes in the shower would have been a luxury with a baby that wanted to feed constantly! I wouldn’t say I felt anything like the pre-baby me and I certainly class different things as a luxury now but I have a purpose and a goal for when my children are a little older and I have more time for my own life. @bex that sounds like you have a really good balance, well done! Having two kids and being a working Mum means that I rarely get time for myself, but as my children are growing up I am trying to make time. I’ve never been one for girly nails and clothes, but I think it is import at to have a hobby or some time to read and relax by yourself. I keep promising myself I will make more time for me, but being able to have a half hour bath instead of a showe seems to be a luxury for me at the moment! @Mumsmoments you are quite right a hobby is just as good as pampering time …. it’s ‘me’ time, so it depends on who ‘me’ is! Great, great, GREAT post. I think the fact that you’re blogging about it and getting so many people to question it is a fantastic thing. I’m not sure there’s a “right” answer but I agree that “me time” is really hard with a young baby – especially if the baby is feeding every half hour! Thank you for sharing your wise words on our blog and for linking up here – we’re really looking forward to seeing the reality of how mums manage to fit in “me time” every week, and what they do with it once they’ve found it. The fact remains that when we become parents our lives change. If you don’t want your life to change then it’s simply; don’t have kids. It doesn’t matter who we are, how career minded we are etc, those kids come first. I do believe women should keep their independence and look after themselves properly, but time is often against us and it can be difficult to keep the balance. I think the graph is more or less accurate. I have a tendency to think that a mother already applies make up every morning and showers day and night because she is a woman. Do woman take care of themselves more so than “young” women. I am also a “young mum” I am 25 with 2 kids under 7. I find it very hard to put myself first, but I assume that this is natural for women who are older than myself. So far the journey of taking care of myself has made me more confident, which helps in taking action on decisions, which helps my 2 daughters take care of them selves (they have someone to look up to). I find that a hobby which combined both taking care of myself (i get to have time out) and takes car of our family, and takes care of our finances is crocheting, or knitting. I prefer to crochet because I find it easier, but it’s a great hobby to have and definitely help to keep my mind active with something none related to uni work or house work or cooking. I’m getting better at all those things, but you see those other things mums do can get boring after a while (ones not related to having fun with out without kids). We need something for ourselves it helps to get a better perspective on life. I don’t feel like I neglect myself or other people when I crochet or sing or dance or say jokes. It’s a great thing to embrace and teach. Thats an interesting point @Mariana wether being a ‘young mum’ or ‘older’ makes a difference. I think that ‘older’ ones can fall into a bad trap of thinking that they’ve ‘had all their fun’ and not remember to take care of themselves. I’ve also seen some ‘in between’ who are so desperate to keep hold of their ‘youngness’ that they hang onto their partying habits like crazy. I was shocked to meet a Mum of a primary school child who still hadn’t gotten into the habit of showering daily. It made me realise how important it is to not take the basics for granted. You are so clever to be able to crochet! I suppose my blogging is my version of it. I find it interesting that you mentioned that “older mums” have some habits. Haha, it’s true yes that there are some mums out there like this. Thankfully I do not have these kind of friends, I suppose any mum at any age can hold on to old habits. Yes, I know it was abit shocking about not having showers in the morning, I can understand that shock. I was oblivious to the shock whilst I wasn’t showering first thing in the morning. The real shock came after I had showered every morning for about a week or so, that’s when I had realised I had been neglecting myself as a person, if not as a mum with 2 girls to become a role model to. Mind you, that I did not have a “morning ritual” taught to me as a young child, I learnt this along the way. I am changing this for my kids! I am a South American born Australian, and over here women and men are “in others views” sharing the same responsibilities. So I don’t feel bad about staying at home, or going out to work, or doing uni work. I have done all three at different stages of motherhood. I stay at home all the time most days, and study university via correspondence. They real problem comes when I explain to people my ups downs of staying at home, because 1. They aren’t living it, I am, and 2. How do explain to someone (for example my older sister who travels a lot) that you actually enjoy the pleasures of being able to sit and read, write, or do a hobby, whenever you want to. This is actually relaxing sister, haha. Anyways, the point Im trying to say, is that I am young, and according to others I should be “outside of the house” more, or being moré glamourous than my “self maintaining” hair. Being a mum who sometimes doesn’t care about how she looks, I know I have plenty of days where I don’t really care If what I am wearing matches because it works for me to get ready so everyone else can be ready. It’s the convienience of not putting myself first! Hah! It’s not actually convenient at all. In my opinion if you don’t have a great self care plan or awareness of the self neglect, then you are already have a limited capacity to deal with issues, and also if you are not very confident or brave enough to tackle life’s challenges then bad habits do accumulate. I met my fiance 4 years ago, and he has been a huge help in pointing out my “flaws” and bringing important things to attention. I have bought your book, and even the very first question is hard for me to answer, there are so many answers. “What do I care about,” well the list goes on. I feel ready to tackle challenges, and bring down some barriers which could have been limiting me. Thank you for giving me the opportunity to voice my opinions. It’s a real pleasure and honour. 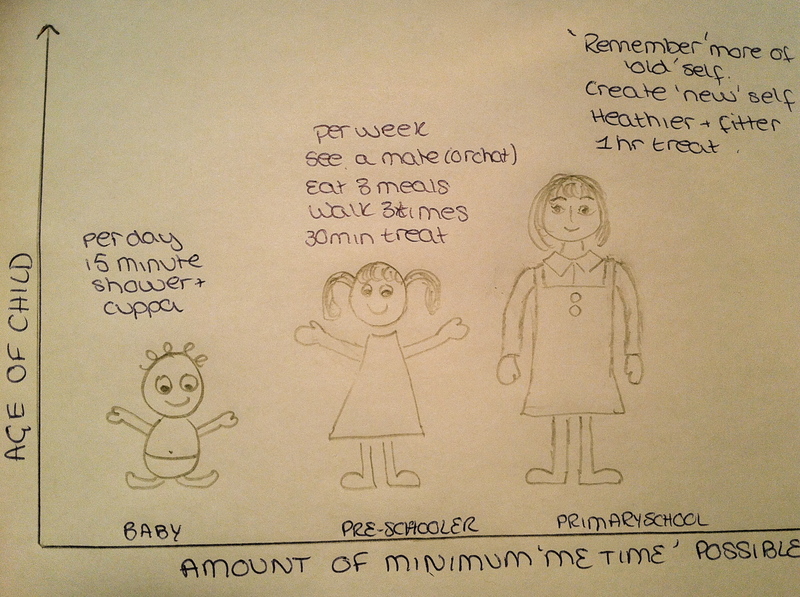 This is actually originally from this website http://kirriwhitecoaching.com/category/mummyhood/, thought I couldn’t find the blog from it’s owner. Thanks for the link @mariana!